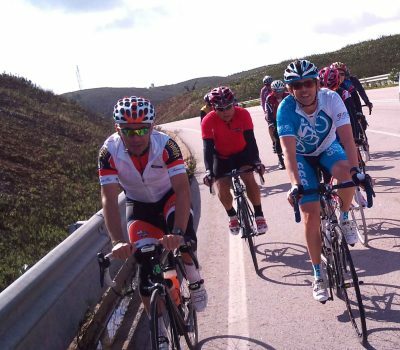 Each cycling route during your Algarve Bike Tour will be tailored specifically for your bike riding ability and experience, you can have a comfortable ride or a more challenging ride, the choice is yours! Sports drinks and nutritional supplies are always on hand to keep the legs turning as well as mechanical and first-aid support for any unforeseen occasion. The Practice Bicycle team have a world of cycling experience available to you, allowing each ride to be perfectly paced so you can appreciate the scenery, take some photos or challenge yourself with a climb if you wish ! First stop is the nearby town of Lagos, a popular holiday destination in the summer and a perfect coffee break before we continue on to the first small climb of the day at Pincho a good name for a climb! Heading further west towards the coast to the Moorish town of Aljezur with its small castle – ‘castello’ perched on the hill top and the endless spectacle of the Atlantic Coast waiting over the final rise. A great spot for lunch and don’t forget to bring your swim wear if you want to put your toe in the full force of the Atlantic Ocean! Today we explore the network of quiet roads that makes the Algarve the most perfect place for winter bike riding in the Northern hemisphere, as we pass traditional homes and farms from a previous time long forgotten in many parts of the new world today. Surprisingly nestled amongst this traditional land is a world-class ultra-modern facility of the International Autodrome, also an ideal track for serious racing cyclists like the Volta Algarve peloton who pass by each year! Lunch time is fast approaching and the village of Alvor is just around the corner! The riverfront has to be one of the most idyllic settings, as you sit and watch the fishing boats come and go. At the end, near the lifeboat station, is a collection of restaurants tempting you with the aroma of freshly barbecued fish. Contrasting views are why we love cycling in the Algarve and the Sagres route feels like we are riding off the edge of the world! This undulating ride takes us to Cape St Vincent and the lighthouse on the most south westerly point in Europe! With a little gem café stop in a typical coastal village with its white washed houses and labyrinth of narrow streets leading down to the beach one of the highlights and spectacular views of the cliffs meeting the ocean before we arrive at the tip of Europe! Enjoy this great ride as we head east to explore the contrasting landscape of the Algarve and discover why it his known as Europe’s hidden secret! 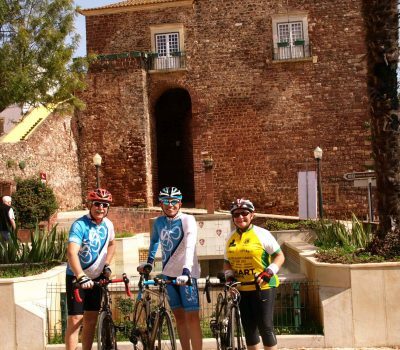 It’s not long before we see the magnificent castle of Silves; the town of Silves was once the capital of the Algarve region and is a popular café spot for Practice Bicycle. This route continues amongst some of the finest tasting oranges’ in the world, with the green trees covered in an abundance of orange it’s wonderful scenery for great cycling. The Algarve is blessed with a variety of great cycling terrain and the interior Mountain Range of the Sierra Monchique is a fantastic ride destination. Our first climbing takes us amongst the forest plantations and spectacular views as we head to the town of Monchique. This wonderful small town with its traditions of wood production and hearty food is a complete contrast to the tourism of the Atlantic coast line way below in the distance. The final climb to Foia (902m) is worth the effort and every pedal stroke with views on a clear day to the Northern region of Alentejano and Lisbon. Perfect terrain for a steady ride amongst the best tasting oranges in the world! Technical winding roads made for a perfect gentle ride.. The Algarve in Southern Portugal is the perfect European Bike Tour destination with warm weather, beautiful blue skies, amazing scenery and quiet roads to explore at your own pace. With its excellent weather conditions and a network of varied, traffic-free roads, the Algarve in Portugal is the ideal destination to do some serious bike training over winter spring.